USPC would like to highlight the National Youth Board Members for the current term. Today we would like to introduce Alex McKinley. Alex is an incoming member for the 2019 National Youth Board. Alex is from Orchard Hill Pony Club in the Great Lakes Region. 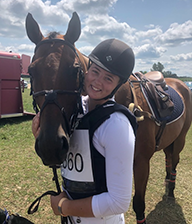 Alex has been active in Pony Club for 13 years and is currently C-3 Eventing and H-B HM certified. She is on her regional youth council and enjoys teaching and helping the younger members in Pony Club. She also joined the Visiting Instructor Program in 2018. Alex will be attending Bowling Green State University in Ohio to obtain her Biology degree with the goal of attending veterinary school starting in 2021. Alex currently works at Schmitts Animal Hospital as a Veterinary Assistant and Secretary. She is competing her new young horse Byron Bay (Tristan) Beginner Novice and is looking forward to competing Novice in 2019 as well as obtaining her B certification.